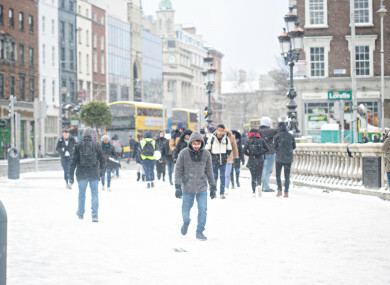 The snow in Dublin earlier this year. A COLD WEATHER payment in times of severe weather events should be introduced, according to Sinn Féin. The proposal is party of the party’s Tackling Fuel Poverty document which explores changes to energy prices over the past ten years and compares these costs to other EU countries. Sinn Féin has said the Cold Weather Payment is in place in the North, and should be established in the Republic. In Northern Ireland, the Cold Weather Payment scheme runs from 1 November 2018 to 31 March 2019. Each Cold Weather Payment is £25. Payment is automatic if you receive a qualifying benefit and the temperature in a person’s postcode area is, or is forecast to be, zero degrees or below for seven consecutive days. Earlier this year, there were calls for additional money to be given during the cold snap. Social Protection Minister Regina Doherty committed to an extra week of fuel allowance in February after the Taoiseach refused to confirm that the government would double the fuel allowance allocation, which drew criticism from the opposition in the Dáil. The fuel allowance is €22.50 a week and is given to some 330,000 people nationwide. The proposed Cold Weather Payment, would be in addition to the fuel allowance. The party maintains that 400,000 households are experiencing fuel poverty in the State due to the increasing costs for household oil, gas, and electricity in recent years. The document also calls for the introduction of a subsidised low cost green loan scheme to enable the purchase of energy efficiency and microgeneration technologies by a wider cohort of households so that increasing numbers can enjoy lower energy bills. Sinn Féin’s Brian Stanley said his Bill on Microgeneration has received unanimous support from all parties this week, adding that the progression of this Bill cannot come quick enough. The Bill, which is not being opposed by government will allow homeowners with solar panels sell their excess power to the grid. Stanley said his Bill wins on two fronts, “it allows households reduce energy costs and also will add to the state’s overall supply of renewable energy”. Email “Calls for a Cold Weather Payment for severe weather to be introduced”. Feedback on “Calls for a Cold Weather Payment for severe weather to be introduced”.